With all the advent calendars, cookie exchanges, family dinners and holiday parties, my kids are drowning in rich food. I need to be mindful about controlling their intake of treats and giving them healthy food more than ever. Fortunately there are healthy snacks like Funky Monkey that are both healthy and delicious! We've already tried and loved their original four flavors, so when Funky Monkey invited us to sample three new flavors, we went bananas. Funky Monkey snacks are freeze-dried fruit. These snacks are gluten-free, and preservative-free, and there are 3 servings of fruit in every bag. They come seven flavors: Bananamon, Carnaval Mix, JiveALime, Purple Funk, and the newest 3, Applemon, Pink Pineapple and MangOJ. They are sold in 1-oz. pouches and can be found at Whole Foods and Target, as well as online at Amazon. We received a pack of each of the 3 new flavors: Applemon, Pink Pineapple and MangOJ. They're all delicious, and the kids love them! They are sweet and crunchy, not soft or sticky, and best of all, they're real, healthy fruit, not sugary candy. They were so happy when they heard we were getting more Funky Monkey snacks, and gobbled them all up quickly. The individual serving sized foil pouches aren't exactly earth-friendly. I wish the snacks came in bigger sizes so I could put them into reusable plastic containers for the kids' lunchboxes. 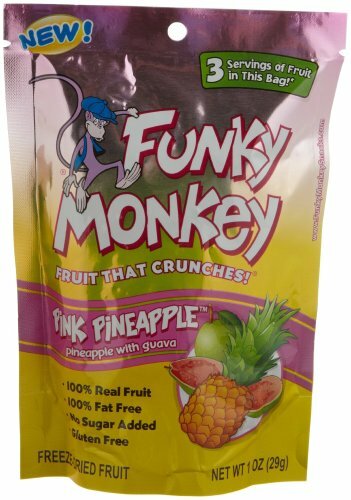 Funky Monkey snacks are truly healthy treats -- the kind of snacks you can feel good about serving your kids anytime. Merry Christmas! Thanks for share good post. Nice blog, I alike this post.